Sponsor a Child – AFRIKAYA – Gambian childrens' charity based in Pewsey, Wiltshire, UK. Why have a Child Sponsorship Programme? All nursery schools in The Gambia are either private or are operated by charities. Many of the families in New Yundum are living hand to mouth and are not able to afford school fees, however small. Sponsored students are carefully chosen by members of the community. State education starts at age 7 and teaching is almost exclusively in English. The majority of children live in families where English is not spoken. Therefore to start primary school at age 7 with no English puts these children at a huge disadvantage. At the Afrikaya Nursery School, the children are taught English but the teaching uses a mixture of local languages as well as English. How many children do we have currently sponsored? December 2018: There are 166 children in the school, 74 of whom are sponsored to attend by a total of 58 sponsors. The Afrikaya Nursery School employs good quality staff, provides a nutritional programme for its students, provides learning material and makes sure teacher training is up to date. It also provides primary health care for its students. What will sponsorship cost me? £10 per calendar month payable via Virgin Money Giving or by Direct Debit – you choose. School materials such as reading books, exercise books, play materials, pens, pencils, paints, paper. A light, healthy meal each school day. A contribution to school development fund. Health care and medication from a qualified nurse. 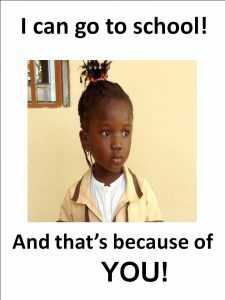 Photo of the child you sponsor. Progress report & up to date photo each school year. Copy of the Afrikaya Child Protection Policy.